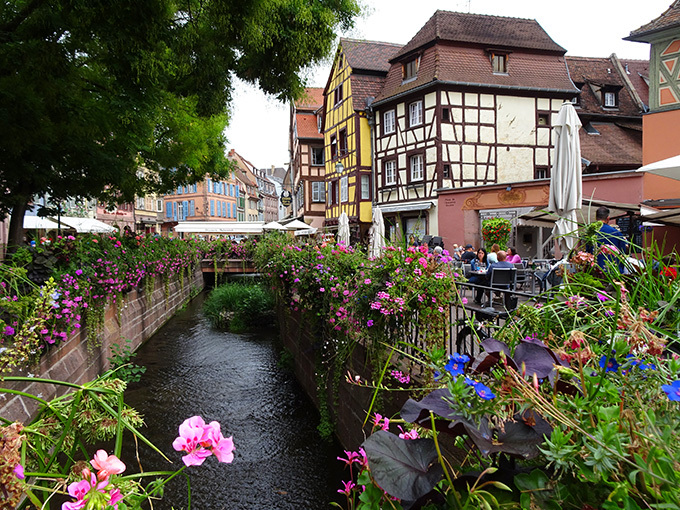 Nothing quite prepared me for the fairytale town of Colmar in the Alsace region of France. 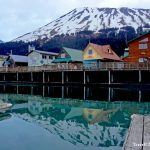 I’d seen beautiful images of this town, but it is even more amazing in reality. Everywhere you look is quaint and like something out of a Disney flick. 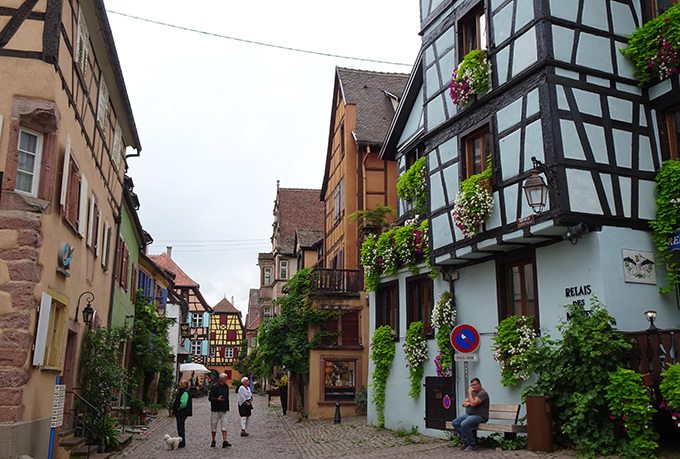 Exploring Colmar, Kaysersberg and Riquewihr, all located in France’s stunning Alsace region was like walking through a fairytale book. 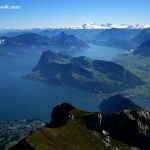 It wasn’t until my visit to these dreamy towns that I finally realised the images in the fairytale books I’d read as a child, such as Hansel and Gretel, were actually based on real existing towns. The impossibly cute houses in Beauty and the Beast complete with turrets must have been modelled after towns like Colmar and Kaysersberg. Fortunately I travelled through Colmar alone, as any travel companion would have been sick of hearing the word ‘wow’ uttered over and over and over again. 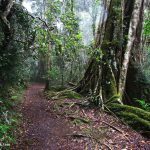 My eyes felt as wide as saucers as I constantly found myself just standing still and turning around in circles to marvel at the unbelievable quaint beauty surrounding me. 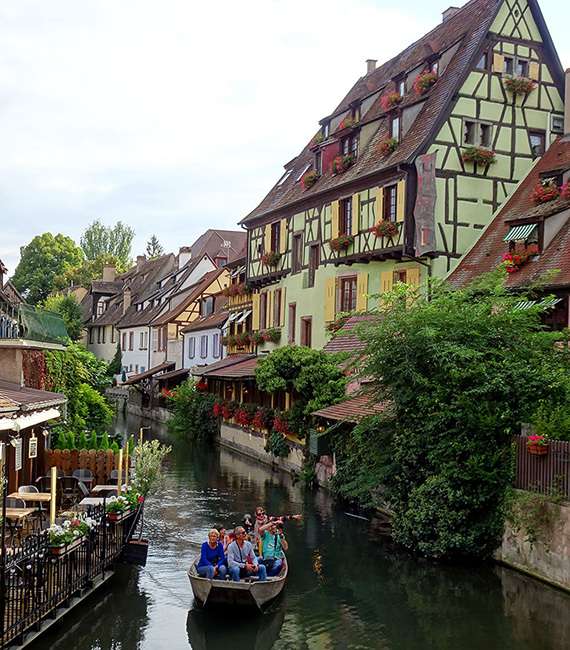 Colmar is small enough to get a sense of the place in a day, but big enough to spend a few days for those that like to lose themselves in a place. 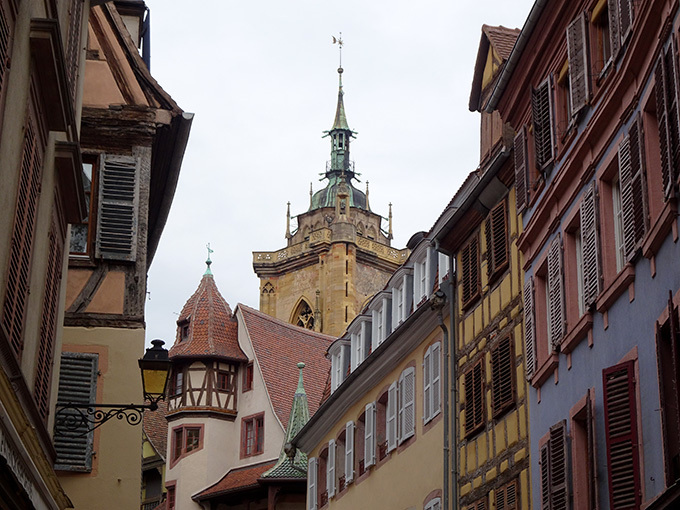 Then again, with all the surrounding vineyards and many quaint villages, it is deal to have spent a few weeks in the region (or at very least a week) using Colmar as a base. La Petite Venise: stroll the cobbled streets lined with canals and colourful old homes laden with flowers. Take boat ride up the tiny canal. Did I say just walk the streets? That to me is the number one attraction in Colmar. 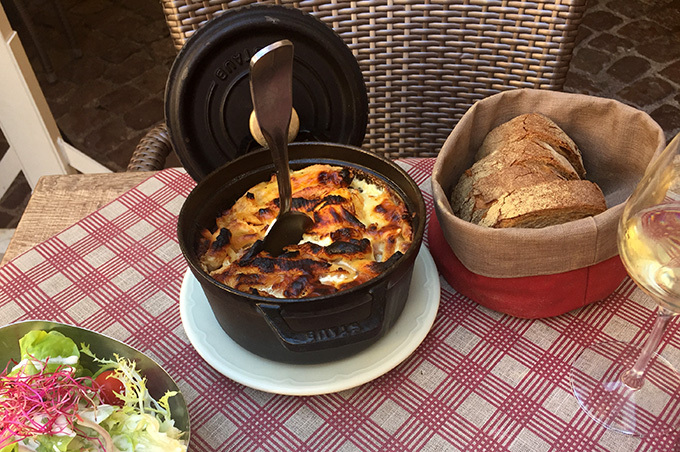 Eat Alsation food (there are dishes that are unique to the Alsace region – indulge in those! 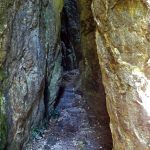 Explore the surrounding areas: villages such as Riquewihr, Equisheim, Huniqwihr and Kayersberg, wineries and especially the Haut-Koenigsbourg Castle (a highlight). 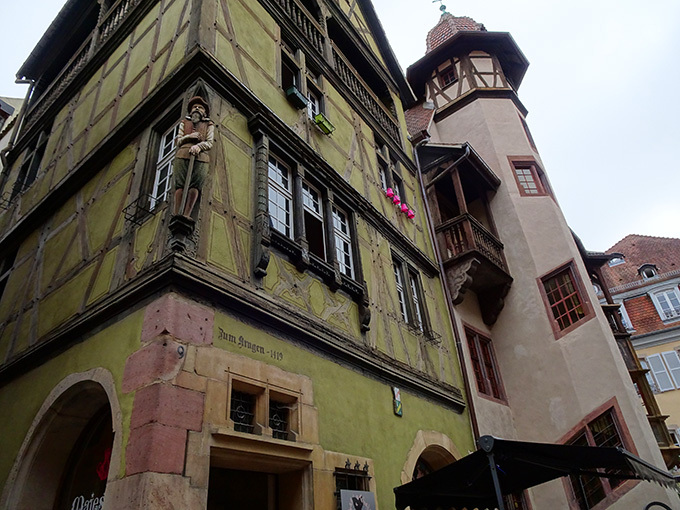 Using Colmar as a base, I visited Riquewihr, Kaysersberg, Ribeauville, Hunawihr and Haut-Koenigsbourg Castle. 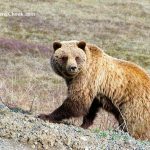 My advice is to take your time as there is so much beauty, you really won’t want to rush! More on Kayserberg and Riquewihr in separate posts to come. They are all so worth seeing. I never expected to fall head over heels in love with Kaysersberg, and even now, I dream of going back there again one day soon. 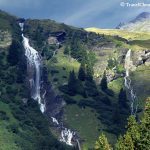 Here’s a story for you, a couple of years ago I came across a picture on the internet of an idyllic village with a bridge and stream – it was picture perfect. I literally ached to be in that village and the image was burned into my mind. Unfortunately, the image did not have any information attached to it and I had no idea where it was. Years later, on this European trip, I visited Kaysersberg and as I turned a corner along a stream, found myself facing that exact image I had seen all those years ago. I will never forget that moment. 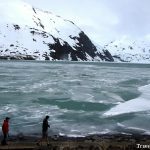 The reality was just as spectacular as the original image, and more so with a 360 degree view. Kaysersberg, you are my romantic fantasy village. Strolling those streets with streams running underneath some of the quaintest shops I have ever seen in my life, jam packed with the most beautifully presented cakes and produce made me almost cry when I had to depart. Spend a full day in Kaysersberg and make sure you have lunch there and take home some pastries. 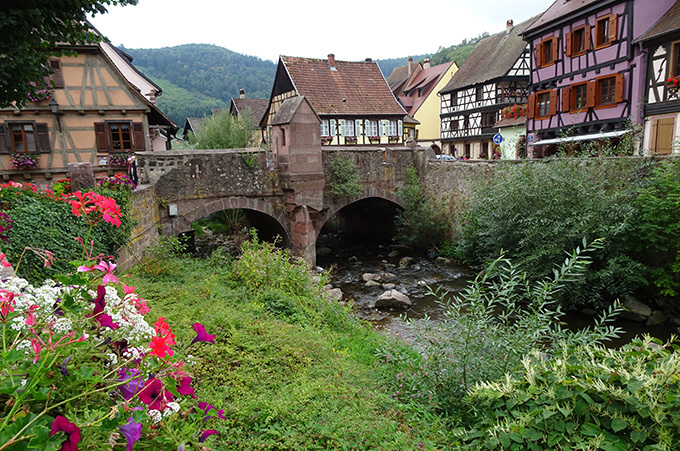 Riquewihr was a smaller but gorgeous village – stunning for a part or full day trip. If you love castles Haut-Koenigsbourg Castle is a must do. After visiting the Palace of Versailles, Linderhof, Neuschwanstein Castle and Warwick Castle, I can honestly say that if I could only return to one, it would be Haut-Koenigsbourg. 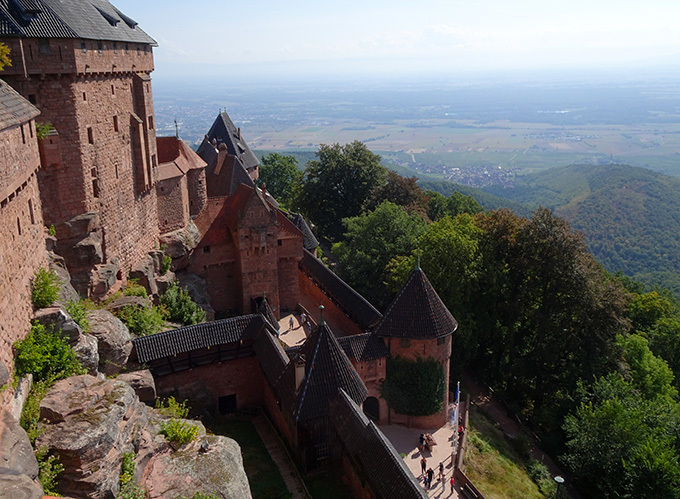 It is a huge breathtakingly beautiful castle located on a hill in a forest overlooking the Alsace region. It is simply absolutely intriguing. If you can spare a day for the castle and lunch, then do it. 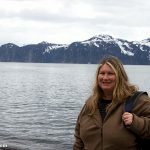 I was so inspired after visiting that castle I started writing a new novel that night. For me, after much research, it was a toss up between staying at the Hotel Saint Martin (for its location and value for money) or Hotel Le Marechal for its location along the canal and it’s charm. Although it was a tough decision, I couldn’t go past the charm of Hotel Le Marechal. A single room without breakfast was in the budget (the cost of a full buffet breakfast is not worth it for me as all I want is 2 eggs and a juice, although I weakened and added breakfast on arrival). Staying in this unique hotel was a treat in itself. 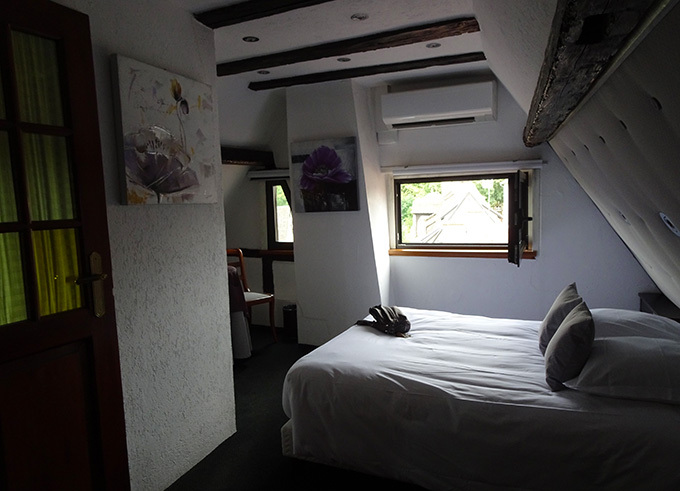 My single room was very spacious, overlooking the canal, with a slanted roof of wooden beams. It sparked my imagination and had such a wonderful feel to it. The bed was extremely comfortable too. Staff made me feel right at home and the breakfast was very nice. 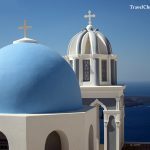 But if you don’t want a full buffet breakfast, there are also plenty of cute and divine bakeries and cafe’s where you indulge to your heart’s content or go super healthy. Hotel Le Marechal where I stayed is the tall green building with yellow shutters- fantastic! I booked a single bedroom at Hotel Le Marechal and was delighted with the enchanting room complete with great view! Where to eat in Colmar is a hard decision due to the plethora of delicious restaurants around every corner. That is another reason to stay as long as possible, the food and wine in the Alsace region is second to none. The region has its own special dishes unique to the area. Lunch at Le Bistro des Copains – so delicious! Baeckeoffe – meat and sliced potatoes cook for a very long time in a pot with a white wine sauce. 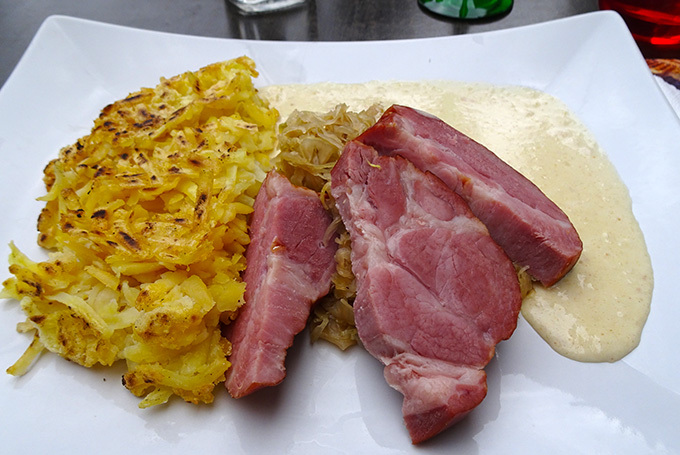 Choucroute Garnie – sauterkraut served with ham, sausage and pork with boiled potatoes. There are variations of this and it is more delicious than it sounds. 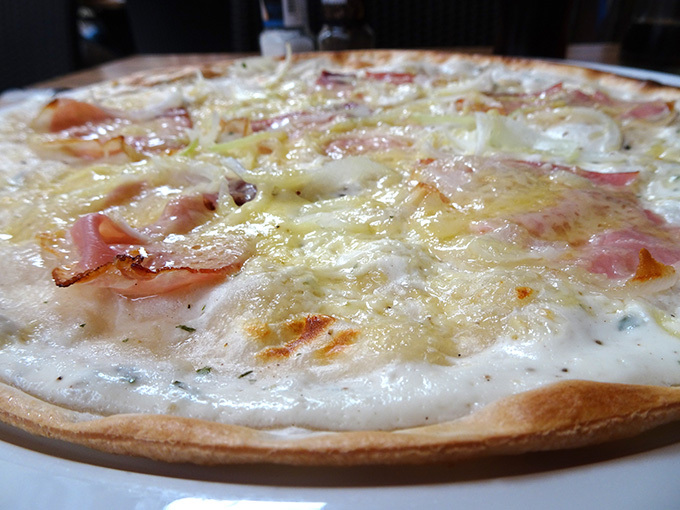 Tarte Flambee – the traditional tart flambee has a thin crispy base smoothered with creme fraiche, onions and Alsation bacon. You can also get these tarts with the regions special soft creamy Munster cheese – you’ll either love Munster cheese or hate it, as it has a very distinct strong flavor. Whatever you do, make sure you check out the many fabulous bakeries and indulge in some sweet joy – do not miss out. Le Bistro des Copains – French menu, no English speaking staff on the day I went, but the food was absolutely delicious and I am salivating just thinking about it. Le Fer Rouge – I had the best lunch ever here – Caquelon de Spatzles (shown below). It was spatzle with speck/bacon and roasted Munster cheese in a hot pot served with crusty bread and salad – oh my Lord – thank goodness I was all alone and didn’t have to share it! Caquelon de Spatzles served with crusty bread and salad – the local wine was an add-on by yours truly. 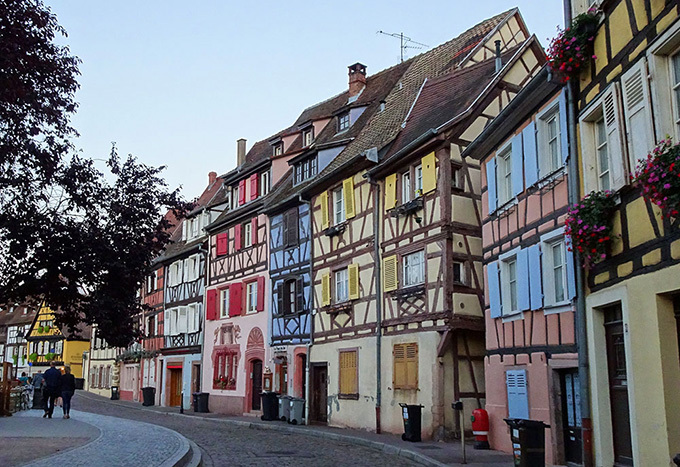 Be aware that many restaurants in Colmar only have French and German menus and many staff did not speak English well or in some cases, not at all. So if you only speak English, there may be a few challenges ahead, but it is all part of the experience. In one restaurant, I thought I was ordering a green salad and got a plate piled high with shrimp. In another, I couldn’t read anything on the menu and had to resort to pointing at dishes on other customer’s plates to show what I wanted (because the wait staff did not speak a word of English). Note to self: brush up on French before going to Alsace region in France again! 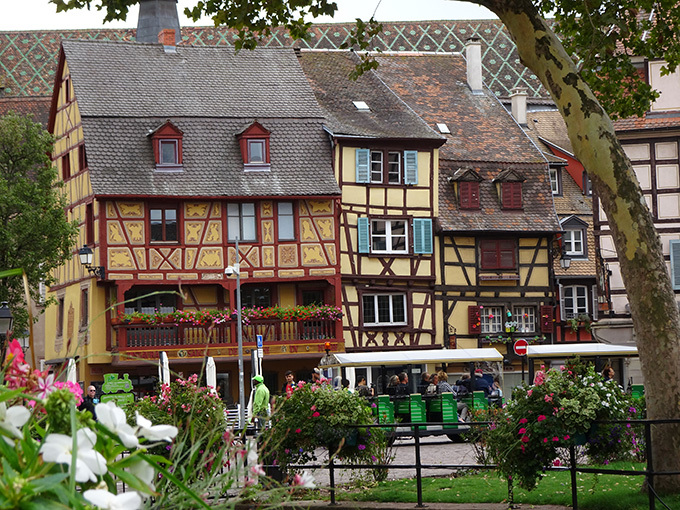 Allow at very least one full day to explore the town of Colmar, preferably two. Allow a full day for a visit to the castle and another full day for 1-2 towns (although personally, I would prefer a day day in each town to do them at leisure and ideally you would see at least two different ones). There are day tours that take you to the castle and a few towns, but be prepared to be rushed through. However, if you only have an extra day to see villages and the castle, then the tours will enable you to achieve this. If you have a few more days, then there is no substitute for doing the castle and villages on your own via public transport, biking or hire car. 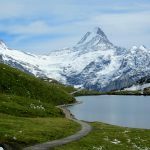 As this will allow you to fully enjoy everything the castle and little villages have to offer, and soak up the amazing sights without having to sprint around a town and then charge back to the tour bus without having a full experience.